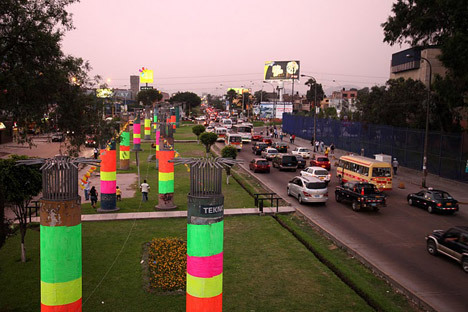 In 1986, the city of Lima, Peru, began construction on a set of concrete columns and passways that were supposed to be part the infrastructure for an electric train system. The plan fell through–maybe it was hatched before its time–and its remnants remained as an ugly reminder of the failure. As of this month, however, the remains have been repurposed into a colorful (and free) playground featuring swings, car tires, a zip line, and plenty of climbing structures. 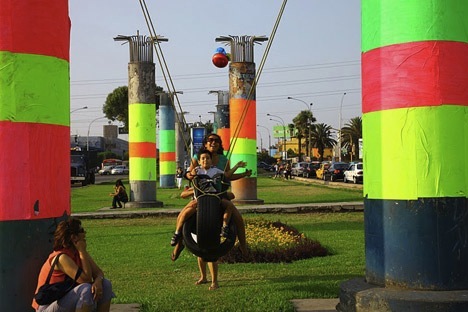 The Ghost Train park was developed by Spanish group Basurama, which has also been involved in trash and waste-related art projects in Buenos Aires, Montevideo, and Mexico City. 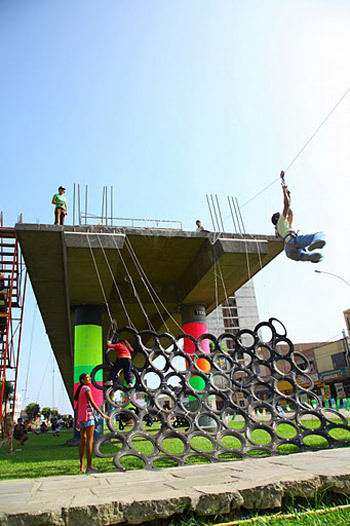 According to the group, “Public spaces in Lima sometimes generate insecurity and are besieged by car horns, we want to show that there’s also room for people, and that we have to claim that.” The same could be said of many American cities that are littered with abandoned structures. Wouldn’t it be great if Basurama could bring some of its magic to Detroit?